In recognition of World AIDS day, the Honorable Ginette Petitpas Taylor, Canada’s Minister of Health, officially endorsed the Undetectable = Untransmittable (U=U) campaign. 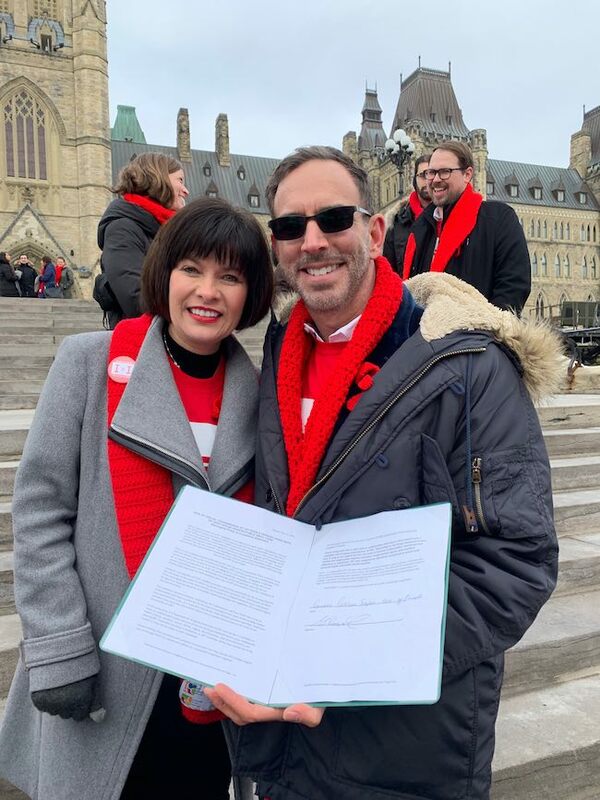 Minister Taylor took part in a red ribbon flag raising ceremony hosted by AIDS Committee of Ottawa on Parliament Hill with people living with HIV and Canadian AIDS organizations from across the country to sign the consensus statment. She later attended the World AIDS Day and Aboriginal AIDS Awareness Week kick‑off event cohosted by the Canadian Aboriginal AIDS Network, the Interagency Coalition on AIDS and Development, and the Pauktuutit Inuit Women of Canada according to a press release. 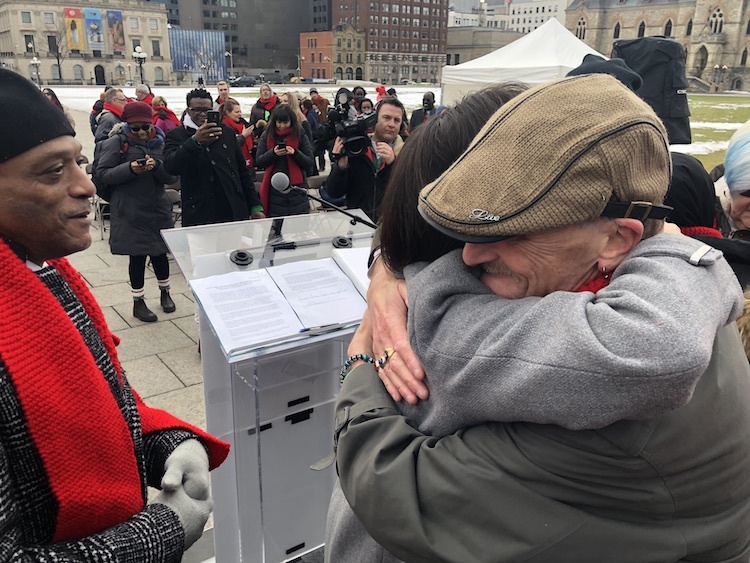 Photo above (from left to right): US activist Bryan C. Jones, Gord Asmus from AIDS Committee of Ottawa (hugging the minister). 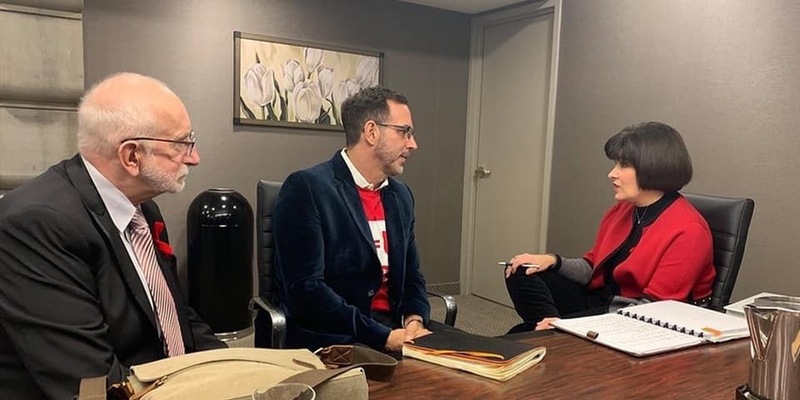 The day before, the Minister held a roundtable discussion with people living with HIV from across Canada to better understand their experiences and as part of the Government of Canada's efforts to reduce stigma. Stigma remains one of the greatest barriers for Canadians in accessing HIV prevention, testing, treatment and support. Bruce Richman of Prevention Access who began the U=U movement said of the occasion, "When AIDS Committee of Ottawa invited me almost a year ago to spend World AIDS day with them this year, I was so excited. Good things always come out of these trips to Canada! The U=U campaign was born in NYC and grew up in Canada when CATIE (the government’s source for HIV and Hep C information) and ICASO and other pioneers signed on and set U=U on an international trajectory. I’ve been fortunate to visit many of the U=U Canadian partners and the people behind them. All of them played a role in getting this movement to where it is today!" Richman spoke reverently about Minister Taylor calling her an extraordinary leader and human being: "Her genuine compassion, commitment and courage moved me to tears during our meetings. This historic and heroic step to sign Canada on to U=U and challenge other federal health ministers worldwide to do so will change millions of lives. She is sending a clear message that sharing the news about U=U with people with HIV and the public is an urgent priority to save lives and fight stigma, and we all must take action." U=U (Undectable is Untransmittable) has repeatedly been supported by scientific evidence that indicates when an individual is being treated for HIV and maintains a suppressed viral load, there is effectively no risk of sexual transmission. Photo above (from left to right): Minister Taylor and Bruce Richman. Minister Taylor said of the endorsement, "Canada is committed to preventing new HIV infections and achieving our global targets. The courage of people living with HIV inspires me. The continued support of initiatives like the Undetectable = Untransmittable campaign are critical to ending HIV-related stigma. Ending stigma will also go a long way in helping us prevent new infections, reach the undiagnosed, and ensure that people living with HIV receive the care, treatment and support they need." Cover photo (from left to right): Bob Leahy, lead U=U activist who brought the campaign to Canada, Bruce Richman, and Minister Taylor.